C.E.Smith Home Improvements,inc. - Winter is coming fast..is your house ready? Winter is coming fast..is your house ready? Have your Roof checked, chances are if your roof is over 10 years old the pipe collars are on there way out. The rubber gasket breaks down and could cause a leak. Perhaps the most important on this list…take some time to inspect your furnace for leaks and replace the furnace filter. You’ll also want to check your home’s entire heating system once you’ve begun using it heavily, and include a test for carbon monoxide (which can be released from some older furnaces if engines or other parts are beginning to crack from wear). If your home is cold or drafty, study the source of air leaks and consider caulking or bolstering existing insulation. Additionally, be sure to insulate pipes in your home’s crawl spaces and attic, as these exposed pipes can be susceptible to freezing. The more insulation you use, the better protected your pipes will be. Invest in a programmable thermostat, setting it to come on at a comfortable temperature in the morning while you are preparing for the day and in the evening when you are home. They are very easy to install and you’ll be happy with the savings reflected within your heating bill each month! If you live in an older home, remove the screens from the storm window frames and think about installing storm windows. Storm windows help reduce the cost of heating your home and help prevent window sills from rotting. Another good idea for this time of year is to inspect the hoses on your washing machine, refrigerator and dishwasher for cracks and/or bubbles. Replace any hoses that show signs of leakage. Clean the clothes dyer exhaust duct, making sure that the space underneath the dryer is free of any debris. Maintaining your dryer prevents lint build-up in the exhaust duct which may pose a fire hazard. Clean the kitchen exhaust hood and air filter. Be sure this area is clean and free of cooking grease as this can also prevent a potential fire. Check your outlets and all electrical holiday decorations for potential fire hazards such as frayed wires or loose connections before you plug them in. To help reduce chances of overheating, please do not overload outlets, bundle cords together or run cords under rugs/carpet. The end of the year is a good time for last-minute interior paint touch-ups, carpet cleaning and for having drapes/curtains professionally cleaned. Prior to the holidays, you may also want to dust or wipe down houseplants with a damp cloth (remember, those plants love humidity so remember to spritz them with water every once in a while) as well as replace flashlight batteries throughout the home in case of a power outage. Lastly, inspect your fire extinguishers and fire alarms and be sure they are in good working order. Check your roof/gutters for ice buildup, and clean out gutters and downspouts. 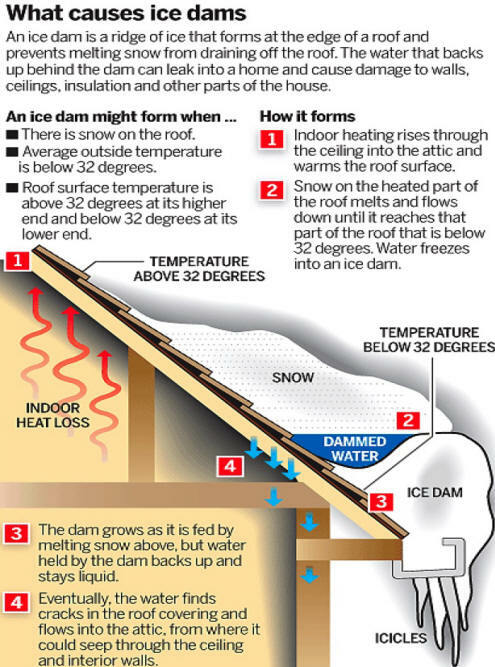 To prevent ice dams from forming, spray water down the downspouts to wash away leaves and other debris. If you notice cracked or damaged shingles, consider replacing them now while the weather is still rather mild to prevent potential roof leaks in the cold. Severe winter weather can lead to damaged shingles, so it’s important to stay on top of any needed repairs. Now is still the time to perform some basic yard clean up and storage. Disconnect the garden hose and store it in the garage or garden shed. Concrete bird baths should be turned upside down so that water won’t pool and freeze, eroding the surface of the basin. Anything else that might be harmed by freezing weather should be stored in the garage, shed, etc. If you choose to leave patio furniture outside during the winter months, make sure all pieces are covered tightly. If you live in a climate that may be affected by severe winter weather, have your snow removal equipment serviced and have rock salt on hand to melt ice on walkways. You’ll also want to make sure exterior steps and handrails are damage-free. Broken stairs or banisters become extremely dangerous for you or your visitors when covered with ice and snow. Store firewood at least 30 feet away from your home and off the ground, ideally in a log rack. This will keep the wood dry and protect it from insects. If you don’t have the space to keep the wood that far from the exterior, leave some room for air circulation rather than stacking it directly against the wall. Take the time now to ensure that your home is fully “winterized”, as performing routine maintenance in preparation for the changing weather will save on major expenses down the line! Copyright 2009 C.E.Smith Home Improvements,inc.. All rights reserved.